ADJ Launch A Thrilling Quest! DJs your “quest” for the perfect LED lighting effect has come to an end, now that American DJ has unleashed the new LED Quest. 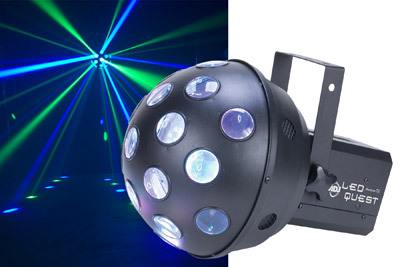 Powered by a massive 15 watts of heart-thumping LED power, this easy-to-operate sound-active effect shoots out bright red, green and blue rotating beams from 19 lenses to cover an entire dance floor or other large area. Containing 1 x 5W red LED, 1 x 5W green LED and 1 x 5W blue LED (15 watts total), the LED Quest projects rich, saturated brilliantly-coloured beams that look great with or without fog. Its mighty LED power, along with its 130° beam angle and 19 lenses, produce a torrent of eye-popping beams that move and rotate to the beat of the music. The beams’ movements are smooth, quick and fluid, thanks to the unit’s high-quality stepper motors. There’s even a strobe effect to add pulsating excitement and work the crowd into a real frenzy. But even though the LED Quest is an eyeful on the dance floor, it’s not a handful to operate. Just turn it on, and this sound-active effect will start moving to the music, running on its own internal programs. A convenient sound sensitivity knob on the rear panel lets users control the degree of intensity with which it responds to the music. DJs can even link multiple LED Quest units together Master/Slave via XLR cable for an instant, synchronized light show over a larger area. With its long-life LEDs rated at 50,000 hours, DJs won’t have to go to the hassle and expense of replacing burnt-out lamps. Another advantage of the LED Quest’s LED lamps is that they produce hardly any heat, keeping things cool and comfortable on the dance floor and allowing the unit to run all night with no duty cycles. What’s more, mobile entertainers can enjoy the convenience of being able to pack up right after the show, since they won’t have to wait for the unit to cool down.